My second book, Invisible Jenny May, (2015, Halo Publishing International) finally launches in two days! The invitations have been sent, food, balloons and books are ordered. Now I sit and wait. Jenny May has rattled around in my head since July 2009 that she's more of a person than a book character, so forgive me if I refer to her as a living being. She began as a true story my husband's Aunt Clevie shared with me at the breakfast table one hot Alabama morning. Soft and low, almost whisper-like, she started. "When I was a little girl, I had a long black braid down the middle of my back. I put on my favorite dress and a white apron with deep front pockets. I'd walked down to Granny's house who made the best southern tea cakes. Fillin' my pockets Granny would say, 'Now I'm fillin' your pockets. You go on back and share the wealth. There's enough for everyone to have some.'" After breakfast, I scribbled this bitty story into my journal before I forgot it. It rolled around in my imagination for months. I wrote at least ten versions until my writers group, my editors, my young audience (ages 4-8) and I were pleased. Now Jenny May has settled into a story about a middle child who feels invisible. Invisible Jenny May does everything right, but despite her good deeds and notable actions, no one in her large family notices her. No one, that is, except Granny. With a little help from Granny and some "magic" tea cakes, Invisible Jenny May discovers the "magic" to visibility. So today, I am happy to finally unveil Invisible Jenny May to the world! A signed copy can find its way to your home by ordering on my website, where you may indicate to whom I should sign the book. Otherwise, you may also order through Halo Publishing International, Amazon or Barnes and Noble. 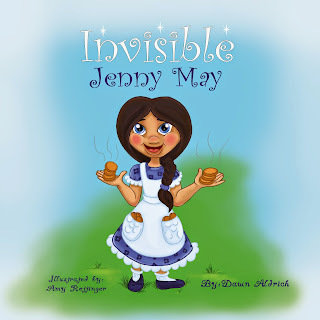 Invisible Jenny May is also available in Kindle and Nook versions. Enjoy! May you discover the "magic" God's placed within you.